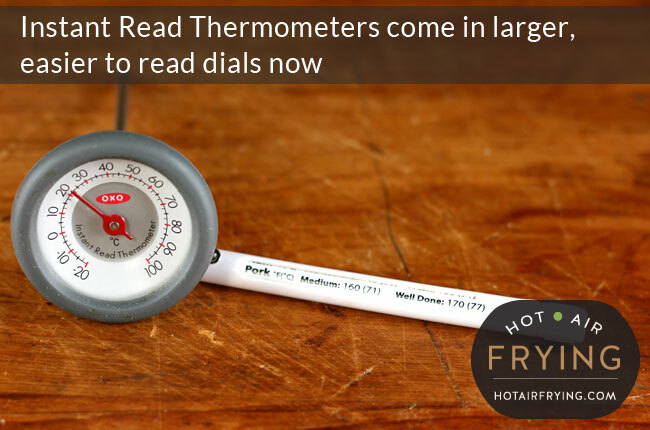 Instant Read Thermometers are thermometers that you stick into food you are cooking to instantly know the internal temperature of that food. They are of course useful in all kinds of cooking, but I have found them particularly useful in hot air frying. Consequently, it’s going to be easy to overcook something. I say “overcook” rather than “undercook” because undercook is easy to fix, you just stick it back in for more cooking. You can’t undo overcooking, and most of us are going to lean towards overcooking for the sake of food safety. Overcooking means less enjoyable, less nice food. It will be drier, rubbery, leathery, etc. At the price of food these days, we want to enjoy it prepared to its optimum point. 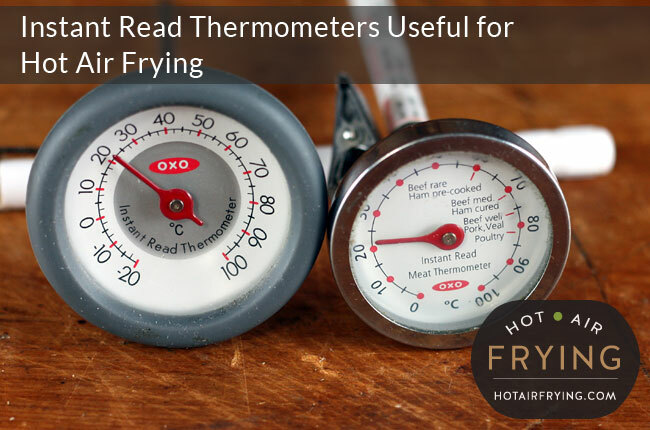 An instant read thermometer lets you know — instantly — when you can stop cooking something. It is mostly used for meat, but it’s also very useful for fish and seafood, and, can even tell you when vegetables are al dente or soft inside, so you don’t overcook your veg, either. They all come with plastic “sleeves” that you store them in for safety (as the sharp pointy bit at the end can be dangerous); the sleeves all have on them a range of safe temperatures for various foods for quick and easy reference. There are large dial ones now, such as the ones above. I love models like this; after a day of working at a computer, why should tired eyes have to squint unnecessarily in kitchens on winter evenings when the light fades early? Note that to keep the numbers larger, such models *do not* tend to come with both metric and fahrenheit on them. You almost always have to choose to go with one or the other. The metric temperature numbers will be a lil bit bigger as there are fewer of them to have to squeeze around the circle. The sleeves usually give recommended temperatures in both fahrenheit and metric. If you are afraid of thinking meat temperatures in metric, I can tell you that within less than a year you won’t even remember how to think meat temperatures in Fahrenheit once you start using a metric thermometer. I got my first metric one by mistake, but within two months, I didn’t think twice about it — but it’s your preference. For me the bigger question is whether to consider a digital model — and I say no. The grey on grey numbers (usually) can be harder to read, and who needs one more thing in their lives to worry about not getting wet in a kitchen, or, when is the battery going to run out and how the heck do you find a battery for it. 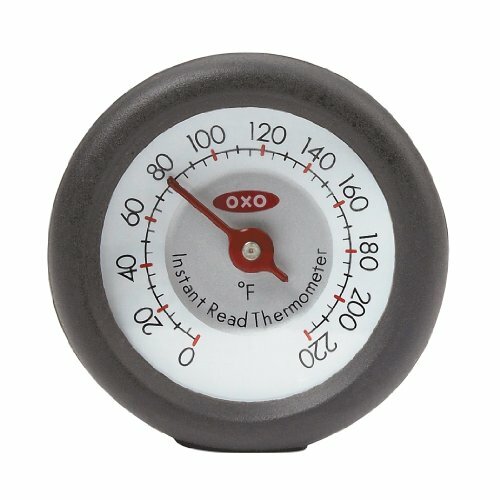 By the way, on the OXO good grips model pictured above, the grey rubber rim around the dial makes the thermometer a bit more forgiving when accidents happen, such as when you watch in slow-motion horror as it rolls off a counter and onto the floor. The one pictured has had several such accidents, and has bounced back from them and lived to poke food another day thanks to the bouncy rubber rim.